I'm working on a few swatches today for a project I've been thinking about for a while. It's kind of a mesh-like stitch with some chocolately tweed, I'll let you know how it turns out! What are you working on this weekend stitchy friends? 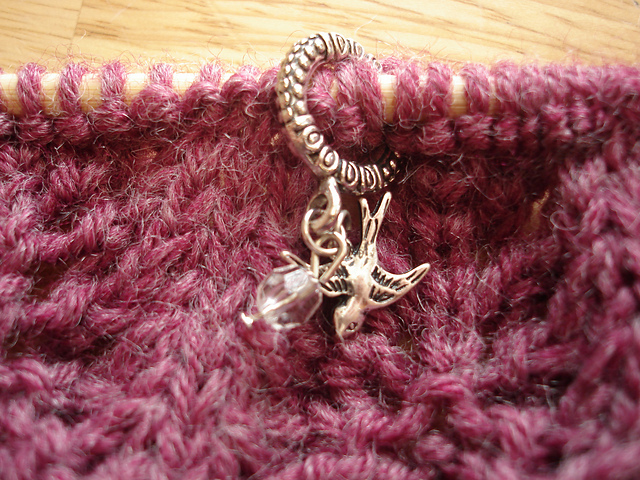 Oh, and if you like this little birdie stitch marker, it's made from a bead, recycled jewelry, and toggle closure! Click here to learn how to make stitch markers from recycled jewelry! For one, I love your blogs and projects with the variety that you give! But I'm also working on a project, one for a friend. She'd always wanted a pair of wrist warmers, so I'm crocheting a pair for her in this black sparkly yarn. The first one looks so pretty!